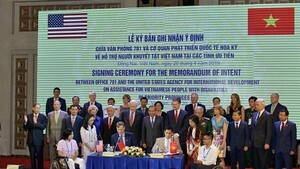 The Japan International Cooperation Agency (JICA) on Thursday signed two loan agreements with the Ministry of Finance to provide 18.88 billion yen (around US$200 million) in official development assistance for two projects in Ho Chi Minh City. The first loan of 14.06 billion yen will be used to complete the Saigon East-West Highway project, while the other loan will be for the HCMC Water Environment Improvement project, JICA said in a statement sent to the Daily. The highway project was partially opened to public in September 2009, and it will be completed next year. The Thu Thiem Tunnel which will connect the city center side and the District 2 side of the highway is being constructed. Meanwhile, the second loan of 4.32 billion yen is mainly for completing the Binh Hung Waste Water Treatment Plant as a major component of the HCMC Water Environment Improvement project. Under this project, the Binh Hung Waste Water Treatment Plant was constructed and started operating in December 2008 with a daily capacity of 141,000 cubic meters. This is the largest modern waste water treatment plant in Vietnam. When the sewerage pipes, currently under construction, are all completed, the treatment plant will benefit 432,000 people. Apart from these two projects, JICA is currently assisting the construction of the HCMC Urban Railway Line 1 (Ben Thanh - Suoi Tien Section).